"Created by designer Jerszy Seymour, the Bureaurama collection features high stools and light and ultra-graphic bar tables. Available in a variety of sizes, they can be mixed and moved at will to create user-friendly relaxation areas or ergonomic workspaces. The Bureaurama high stool is made of aluminium, its welds visible for a deliberately raw look. On a black background, dots of white paint have been applied by hand, making each piece unique. These splashes of white remind us of clusters of stars within the galaxy, creating an impression of infinity for all who view them. The base consists of two straight feet and two compass feet: they draw clean, airy, easily legible lines. 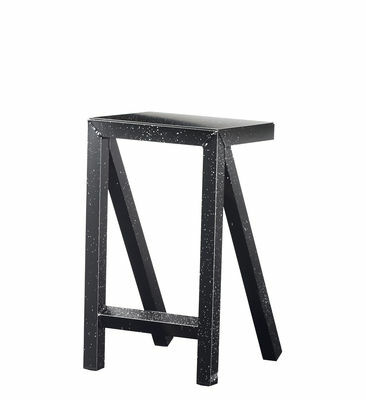 Compatible with outdoor use, you can use this high stool on your terrace or in your garden. Jerszy Seymour: "This collection is designed as a place to reconsider our future, discuss and make informed decisions, or simply to scribble, have fun, and enjoy ourselves."